(Phys.org) -- In the pursuit of precision measurements, nothing is simple, even when the apparatus employed appears to be utterly uncomplicated. An instructive case in point is the new ionization chamber used to determine the U.S. primary standard for radiation dose in air -- or, strictly speaking, air kerma, the amount of kinetic energy released per unit mass of air by ionizing radiation. That standard has numerous critical applications, including medical therapy, radiation protection, and environmental exposure monitoring. It is defined and maintained with equipment that may at first seem less complex than a toaster ovenuntil the full scope of the multidimensional measurement process is understood. Scientists measure air kerma* by allowing a beam from a radiation source, such as x-rays, or gamma-rays, to irradiate an ionization chamber (measurement device) for a specific time at a specific distance. The air kerma standard from x-ray sources, and cesium-137 and cobalt-60 gamma-ray beams, is defined and maintained by researchers in PML's Radiation and Biomolecular Physics Division, who recently developed a new underground cesium-137 gamma-ray beam irradiation facility. The new facility was designed by Minniti in collaboration with a U.S. manufacturer Hopewell Designs Inc. "Our older cesium-137 beam facility was built in the 1960s," says Dosimetry Group physicist Ronaldo Minniti, "and it was clearly time for improvements. The new one will allow us to reach a broader range of air kerma rates and improve the reproducibility of our measurements. The new facility contains a newly designed irradiator, a remote controlled positioning track system for placing detectors and ionization chambers in front of the radiation beam, and a much improved safety system. But prior to being able to use this facility, the radiation beams need to be characterized in terms of the radiation dosimetric quantity air kerma. And for that we use ionization chambers." Specifically, the group uses ionization chambers, two of which Minniti designed in collaboration with the German manufacturer PTW-Freiburg. The ionization chamber consists of a spherical graphite wall cavity in the center of which is an electrically insulated collecting electrode. The spherical cavity is open to the air, and a high voltage of hundreds of volts is applied between the cavity wall and the central collecting electrode. A schematic diagram of the ionization chamber. As radiation photons pass through the chamber, they ionize some of the air molecules, resulting in a spray of electrons and positive ions. Due to the applied potential difference, the charges are accelerated towards the collecting electrode generating an ionization current that is proportional to the incident radiation dose. Therefore, the higher the incident radiation dose, the greater the ionization current generated by the ionization chamber. 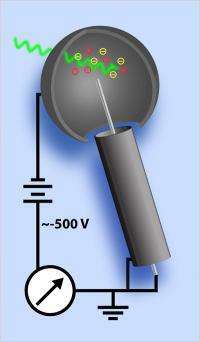 The ionization current is measured by a high-accuracy electrometer device. Minniti's new chambers allow determining air kerma from fundamental principles. "The chamber is designed with a tool that allows an accurate measurement of the cavity volume," he says. 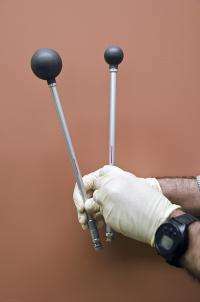 "The spherical shape presents a few more challenges than other shapes both in the manufacturing process and the subsequent volume measurement. But it is worth the pursuit since it is different from chambers used by nearly all other national metrology institutes (NMIs) around the world. In this way we can provide an alternative way of determining the air kerma standard from gamma-ray beams." The newly designed chambers have robust construction and very low electrical leakage. They are now being sold by PTW for use as primary standard chambers. The cesium-137 is enclosed in the brown metal irradiator unit (at left). An ionization chamber is placed on a vertical mount (at right). "The principle of operation of an ionization chamber is quite straightforward and combined with a good instrument design it results in a very reproducible and robust measurement device," Minniti says. "This makes it an ideal instrument to be used for a primary measurement." However the determination of the air kerma standard requires a careful and systematic series of measurements. The process includes the careful measurement of the ionization current generated by the chamber, the determination of the air cavity volume and density and the determination of multiple corrections that need to be applied to the standard. In some cases the methods required are standard; in others, new questions arise and can lead to new investigations and measurement methods. For example, the ionization current is a sensitive function of the exact volume of air in the enclosure. Although PTW fabricates the 3.5 mm graphite wall to exacting tolerances, the specific volume of each detector is slightly different and must be determined independently at NIST. This is done by filling the cavity with water and taking multiple measurements of the mass of the cavity with and without water. When the water is removed, the chamber is kept in a dry environment until it recovers its initial mass. This process can take several days for a single measurement, and is later repeated multiple times to obtain a measurement of the volume with a low standard deviation. Moreover, Minniti and colleagues must account for other effects which result in corrections that need to be applied to the measurement of the air kerma standard. Some of these effects are measured, while others are calculated using Monte Carlo methods. For example in an ideal or mathematical model a spherical chamber is a cavity suspended in space in front of a radiation beam. But in reality the chamber has a stem (see Fig 2). Photons that interact with the stem can be re-directed into the cavity due to scattering. As a result an additional contribution from stem-scattered photons will be measured by the chamber cavity. Separate measurements are made to estimate the so called "stem correction" to account for this effect. And that is just the beginning of a series of intricate corrections for a host of factors that affect the entire process. "In developing a national standard, reproducibility of measurements is of critical importance. Once you have all your corrections determined and effects well understood you need to repeat the measurements multiple times to ensure reproducibility", Minniti says. Since these measurements are made over months, a correction also needs to be applied to account for the nuclear decay of the radioactive source. (Cesium-137 has a 30-year half-life.) That allows the scientists to reference all measurements to a single day of their choice. Depending on the air kerma rates delivered by the sources and the size of the chamber used, the measured ionization currents range from a few tenths of femtoamps (10-15 A) to tenths of nanoamps (10-9 A), more than six orders of magnitude. So the scientists use chambers with different volumes to accommodate this wide range of air kerma rates. The primary graphite chambers designed by Minniti in collaboration with PTW have nominal volumes of 10 cm3 and 50 cm3. But one can find transfer chambers (for transferring the primary standard measurement to users) that are commercially available with volumes spanning from a fraction of 1 cm3 all the way up to 20,000 cm3. After the determination of the various air kerma rates in the NIST reference beams is complete, the typical overall uncertainty of the measurements are found to be of the order of a fraction of one percent. This low value of uncertainty provides a good start for facilities that send their instruments to NIST for calibration. But before NIST can disseminate the national standard through calibrations to others, it participates in international comparisons with other NMIs around the world. "So at the end of the day, if you determined all your sources of uncertainty correctly and accounted for all possible effects appropriately, then all NMIs should agree," Minniti says. "So to close the loop you need to participate in international comparisons, and to continue to do over the years to ensure that you can deliver high quality and accurate measurements to others within the United States. We recently completed an international comparison for the air kerma from cobalt-60 at therapy levels. It lasted four years and involved 26 countries. In the end, agreement was pretty good  within plus or minus about half a percent." More information: * The direct measurement is roentgens per second, which is converted to kerma.